The Donald Sterling recording has been all over the news recently. 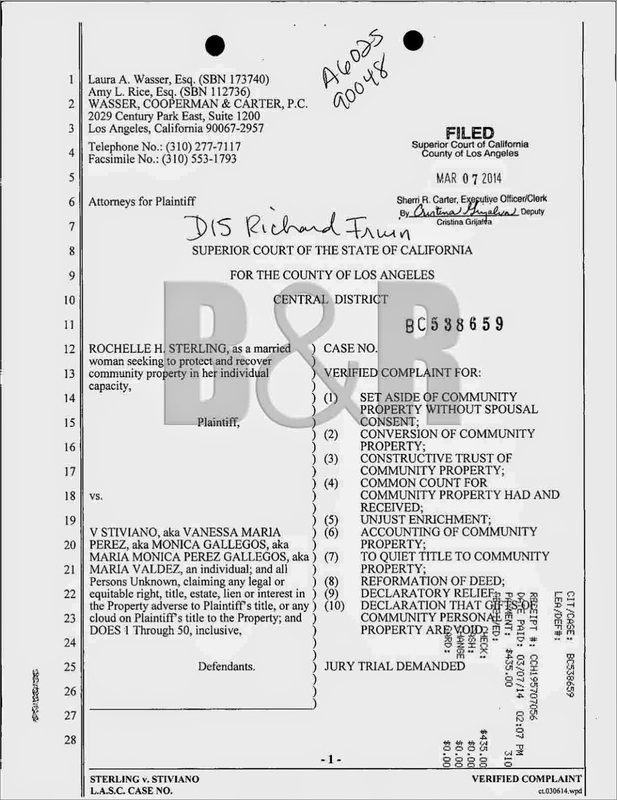 Supposedly, the tape was released by V. Stiviano to gain leverage in a lawsuit that was filed against her by Donald Sterling's wife, Rochelle Sterling. Mrs. Sterling alleges that Mr. Sterling gave V. Stiviano more than $2 million in marital funds, including a $1.8 million townhouse, $240,000 in cash, and more than $500,000 in vehicles, including two Bentleys, a Range Rover, and a Ferrari. Mrs. Sterling wants her money back. I'm still trying to locate a full copy of this complaint, but I do have the first page. Illinois is not a community property state, so I am not familiar with the law behind Mrs. Sterling's theories, but the titles of all ten counts are spelled out pretty clearly on this first page. You'll see counts for conversion, constructive trust, unjust enrichment, etc. If anyone has a copy of the full document, please let me know. Tip of the hat to www.black-and-right.com for posting this photo, and also to Laura Erickson (@impetrio1) for directing me to it on twitter.